December 3, 2014 December 3, 2014 Nefer Khepri, Ph. D.
Free Tarot Reading: Month of December, 2014. Today I present a free Tarot reading on the energies for the month of December. For this reading I am using The Starlight Illuminated Tarot, by Carol Herzer. Carol adds fantastic color to the Rider-Waite-Smith (RWS) Tarot giving it new life and vibrancy. I have never been a fan of the RWS despite it being the deck I used when I first learned to read Tarot, but I must say I absolutely love Carol’s rendition of it. The Starlight Illuminated Tarot is gorgeous and the colors Carol uses makes each card come to life. I will be reviewing this deck in a future blog post. Meanwhile, you can read about Carol’s decks here (she does have other decks as well) & you can contact Carol at Soul Guidance: sun19@earthlink.net. Now on to the reading. At first I was going to make this only a 3-card draw, but I wasn’t too crazy about what those 3 cards were telling me so I drew 2 more cards for clarification. Normally, when examining the day, week or month ahead I draw only 3 cards and merely stipulate in my question that I am looking for information on what to expect from my day, week, or month. The original 3 cards received are the 3 of Pentacles, 7 of Swords, and The Empress. 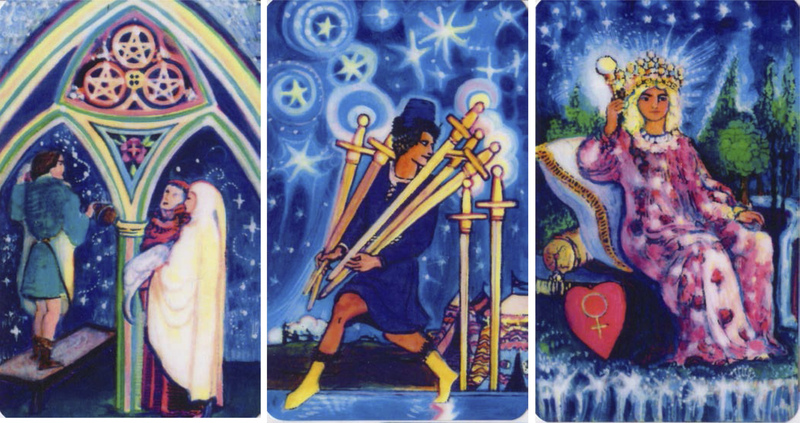 The 3 of Pentacles, 7 of Swords & Empress from “The Starlight Illuminated Tarot” by Carol Herzer. The subject or topic card, the 3 of Pentacles, represents your work or something you create with your hands. Traditionally, this is the card of the stonemason and it can represent a person who is highly skilled working with their hands. As a result, it can represent creative pursuits and creations as well as the 9-to-5 work environment. So here we know the topic of the reading will focus on work for the month of December. The major influence is the 7 of Swords. Hmm. That’s what I always think when this card appears. The 7 of Swords represents the thief in the night, someone who makes off with what does not belong to them. Usually, when this card appears it indicates that something is about to be taken away. Here, it follows the 3 of Pentacles so it appears that someone will attempt to perhaps take credit for someone else’s hard work or perhaps run off with someone else’s idea and claim it as their own. So we all need to be weary of some type of mischief in the workplace. The original outcome card is The Empress (by original, that means I drew 2 more cards for further clarification that I’ll discuss below). As a card of the major arcana, The Empress embodies the universal archetypes of Motherhood, Fertility, Creation, Nature, and Abundance. She can represent a female in a reading. Here, what I am feeling is The Empress represents the abundance our jobs bring to us in the form of monetary income, plus the fertility and creation that many of us have through our work as we use our minds to come up with creative solutions in order to complete our work tasks. The Empress serves as an important reminder that when people with the energy of the 7 of Swords make themselves known in our lives we need to realize they are not the creative ones, we are. They have to rely on subterfuge to do well at work while we use our natural skills and acquired knowledge. This indicates that although someone may attempt or even get away with taking credit for your work or an idea, that eventually you will come out on top and go on to better things. I found that intriguing so I drew 2 more cards to see how The Empress card would pan out. I pulled the 8 of Cups and the 8 of Wands randomly from 2 different places in the deck. 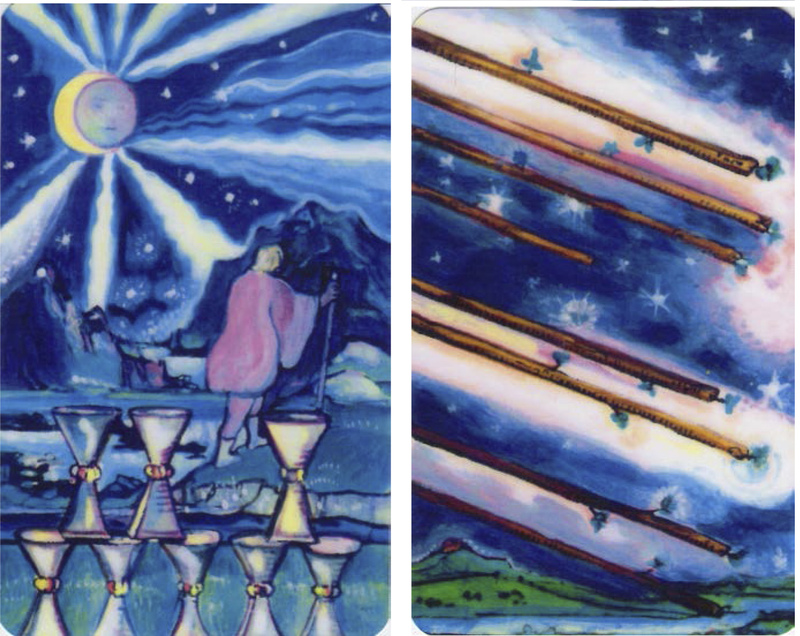 The 8 of Cups & 8 of Wands from “The Starlight Illuminated Tarot” by Carol Herzer. I guess sometimes we’ve taken all we can take. The 8 of Cups is about leaving a well-known and perhaps even comfortable situation behind and striking out for the unknown. We all have at one time or another (or even repeatedly) have had to deal with a person who attempts to take credit for our work. In grad school students had ideas stolen – not by fellow students as you would assume, but by professors, even some professors who were already widely published. This almost happened to me with my dissertation. Luckily, when I went up to confront my professor two other students went up with me to say they had heard me present the same information in this same professor’s class earlier in the week & she was merely couching my idea in new terms thinking she’d get away with it. I was so livid at the time I could barely think straight, but my first thought was that if I don’t get my professor to back down I’m leaving that university and seeking my doctorate elsewhere. Thankfully, it did not come to that. She backed down because she had us 3 telling her she was wrong to claim this idea as her own. That is often our first reaction when something goes terribly wrong. We wish to leave, just up and leave and not look back. So the 8 of Cups is saying that for some of you this work subterfuge may be the straw that breaks the camel’s back. You may decide to start looking elsewhere for new employment. Just remember, ignorant people are everywhere and you don’t want to jump from the frying pan into the fire. Carefully evaluate your situation because each will be different from another and determine if seeking new employment is really what you should do at this point in your career and in your life. The next card, the 8 of Wands, tells us how things from the 8 of Cups will work out. The 8 of Wands is the card of speedy developments in a situation. It can represent messages and travel as well. Following the 7 of Wands, which is about standing your ground and defending your position, I often view the 8 of Wands as the ability to drive your point home once you’ve made it. Here, the 8 of Wands is saying things will develop quickly in the situation so you may want to carefully reconsider any thoughts about leaving and stick around to see how things work out. In other words, leaving may be a bit premature. Some sort of resolution is being hinted at with the 8 of Wands. If you are interested in a Tarot or a Lenormand reading from me, you can find ordering information posted at my website. Due to client demand I typically book up for readings 2 weeks in advance so please keep that in mind when ordering. All orders are filled on a strictly first-come, first-served basis & my readings look and read exactly as what you’ve just read here. Previous The Egyptian Lenormand Goes to Press!